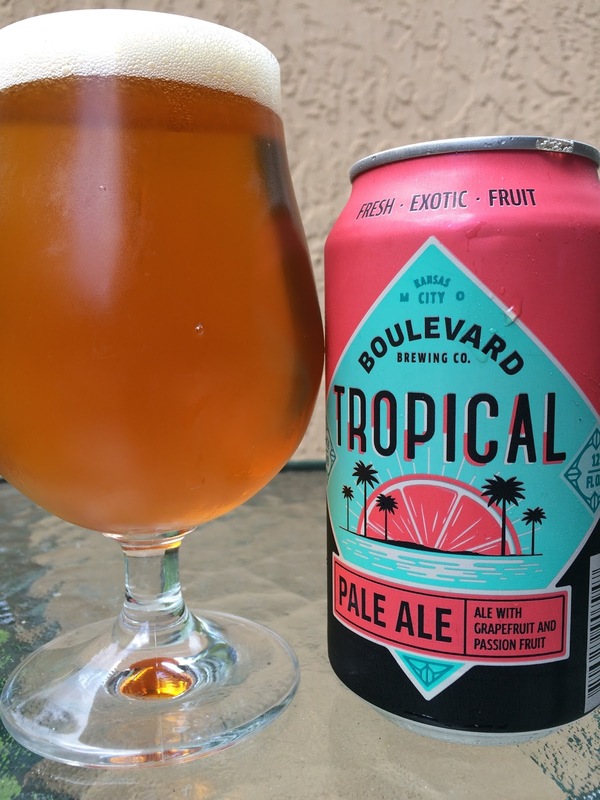 Today I'm checking out Boulevard's Tropical Pale Ale, brewed with grapefruit and passion fruit. Reading the fine print on the can, this beer was actually brewed and canned by Firestone Walker in Paso Robles, CA, under Boulevard's supervision. Easter colors and palm trees on the can definitely say "tropical." The rim of the can says "FRESH EXOTIC FRUIT." I'd have definitely added a Y to FRUIT for some grammatical consistency, but I guess that's why I don't work in the industry. 5.9% alcohol. Canned on 6/29/16. Nice aroma, very fruity, full of tangerine citrus and sweet passion fruit and just a touch of spiciness. Big grapefruit bitterness hits your palate to start, resinous and full of zest. Tangerine citrus follows, less harsh, and then the miracle... some tropical passion fruit balance really smooths out the initial sharpness. Full cycle, super bitter to beautifully tame. Fruity, spicy. Great back and forth contrast, sweet and bitter, spicy and smooth. Very tasty and I could drink this all day! Just need to go back to the liquor store! Check it out!